Easy to book with Ann Carter. With a reading, in person or on the phone, we can work together to give you what you need. Get clear answers you are looking for. Many clients are looking for direction with career and relationships and clarity on family issues. When I see something your guides are sharing with me, I will share with you. What you need to know is that your guides and your higher self may have news to share that you were not expecting. I promised to be a communicator between the spirit world and ours, so anything I get from the spirit world, I must share. Want to learn how to meditate? Want to learn how to meet your Guides? Want to learn how to communicate with your Guides and Angels? 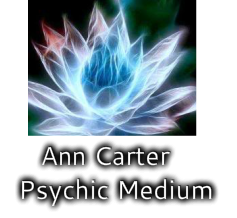 Want to learn how to develop your own psychic abilities? I offer in person classes and live webinars in several classes. Check out the Classes tab for more information!